Osteo Arthritis of the knees is the natural form of arthritis that is brought about by the wear and tear of the knee joint cartilage. The knee joint relies on the cushioning property of the cartilage for its normal functioning. When this cartilage wears away, it leads to a situation where the bones of the joint directly scrape each other leading to pain and inflammation. Age is one big factor while considering OA of the knees in general. As the years pass by, the ability of one’s cartilage to heal diminishes. For some people, besides age, it can be a hereditary reason too. It can also occur due to excess body weight. Women above the age of 55 are likely to develop the condition, more than age in the same age group. A lot of activities, sports and jobs involve situations that may place a lot of stress on the knees. Weight lifting, running on hard surfaces, playing tennis, soccer and long-distance running really put the knees to the test and hence, participants must always take precautions to avoid damage, long term. 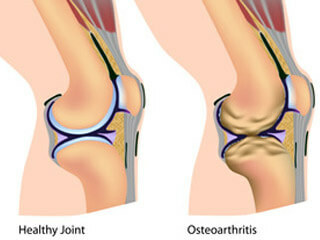 Sufferers of Rheumatoid arthritis are also prone to develop osteoarthritis. Treatments vary from exercises to strengthen the knee joint to surgery. Weight loss is also an effective treatment for knee pain relief as it lessens the load. Pain relieving drugs, anti-inflammatory drugs, steroids and hyaluronic acid are also used for treatment in the form of injections. If you would like to know more about Osteo Arthritis of the knee or its treatment methods, please do not hesitate to get in touch with us. The general position of any person is composed from of a large number factors, among which the most important. Kinds well-being presented difficult system, on which not only common mood depend, but also ability to work of the organism. No chance understand and explore health, types well-being, and also others components of the healthy strong organism, if thoroughly not go into the next concept. So, the health of a person, to date, is called standard and durable psychosomatic state of the individual.